One of the joys of being an Aga owner is being able to pop a dish, be it a joint of meat or a casserole perhaps, into the bottom oven (the simmering oven) and forget about for several hours or all day, or in this case overnight, and when you return, it has magically transformed into the most succulent and tender of feasts. 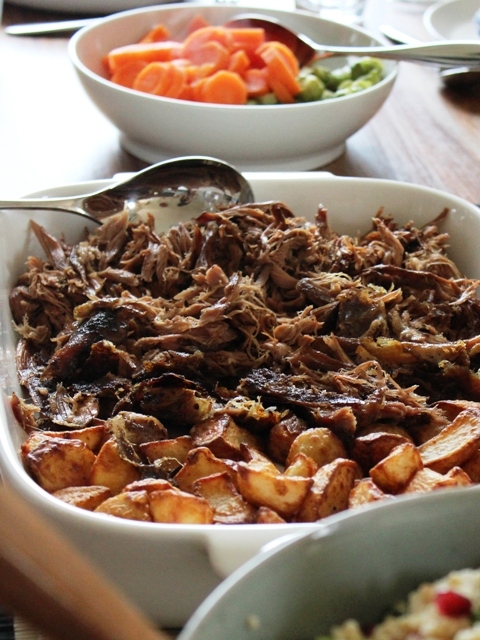 As it’s a rather fatty meat, lamb is perfect for slow-roasting, as the fat keeps the meat mouth-wateringly moist. 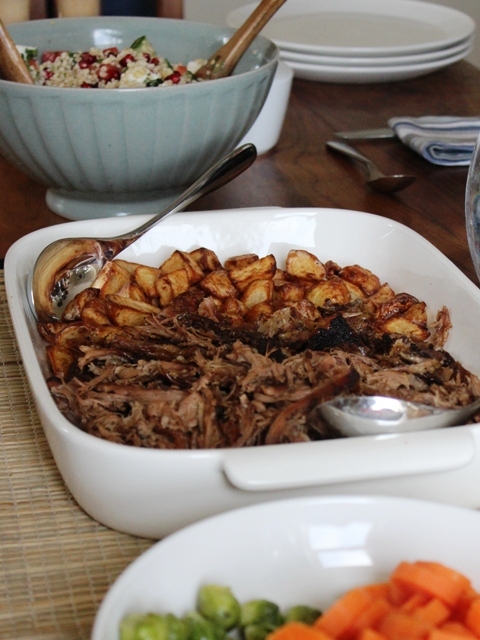 This slow-roasted shoulder makes for a very special meal, and since a large joint of lamb isn’t particularly cheap, I’d save it for suitably special occasions or big family gatherings. But the beauty of it is that’s so incredibly easy to do, yet tastes a million dollars. And I reckon you do get your money’s worth. One shoulder of lamb served seven of us for Sunday lunch, with plenty of leftovers for a further two more meals during the week. Lamb with fragrant spices is a match made in heaven, particularly North African flavours as found in the ras-el-hanout spice mix, which according to Wikipedia is Arabic for ‘head of the shop’ or as we’d say in English ‘top shelf’ implying a mixture of the best spices the seller has to offer. You could have a go at making your own ras-el-hanout with toasted cumin and coriander seeds, cinnamon, ginger, black peppercorns, turmeric, cardamom seeds, saffron, and maybe some dried rosebuds – although the exact spices used varies from one recipe to another. However I opted for a ready-made ras-el-hanout mix sent to me to try by Sanjay and Shashi Aggarwal at the Spice Kitchen. 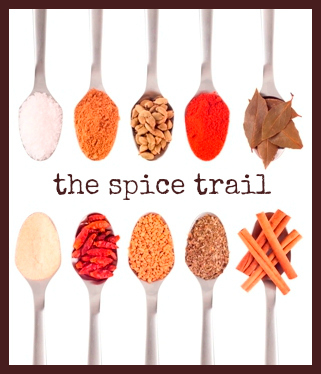 The Spice Kitchen is a small family run artisan spice company, specialising in a range of spices and spice blends. The business was set up in 2013 by Sanjay for his mum who he says “is an amazing cook and oracle on spices, having grown up around them in Kenya and India”. They started up selling Indian keynote spices but have grown quickly and have now developed a range of international spice blends using their high quality range of whole spices and old production methods, including garam masala, panch phoron, jerk, Mexican, Sri Lankan, Chinese, ras-el-hanout and baharat. I am gradually working my way through the various spice mixes the Spice Kitchen kindly sent me to test out. The baharat (a Middle Eastern mix containing cloves, black pepper, cumin seeds, nutmeg, paprika, cardamom and cinnamon) was wonderful as a rub for sirloin steaks, and their ras-el-hanout was simply sublime mixed with olive oil and rubbed into the shoulder of lamb before slamming into the oven overnight. I very much look forward to experimenting with the rest of the collection. 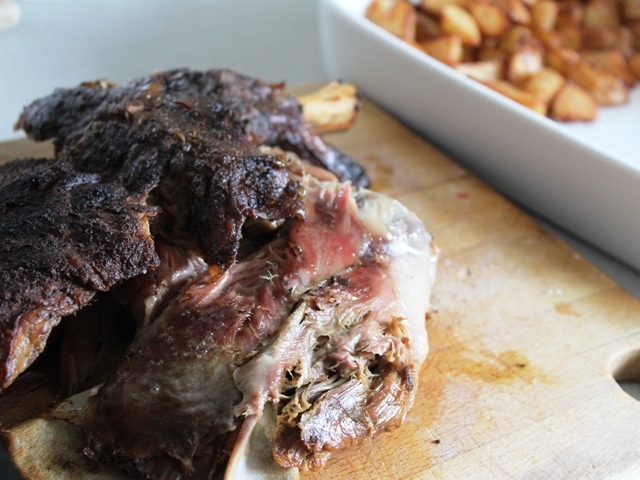 Place the lamb shoulder into a large roasting dish and slash the meat all over with a sharp knife. Pour the oil into a small bowl and mix in the ras-el-hanout. Use your fingers to smother this all over the lamb, working it well into the meat. Cover with foil and place in the top roasting) oven of the Aga for around 15 minutes and then transfer to the top of the bottom (simmering) oven and leave there for 8 to 10 hours or, as I did, overnight. And that is seriously all there is to it. Job done. Simply pull the meat off the bone with a couple of forks. 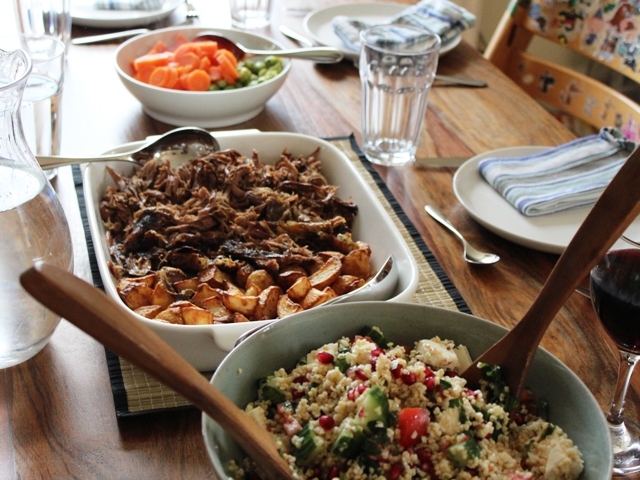 I served mine with a bulgur wheat and pomegranate salad, vegetables and tzatziki. If you have a conventional oven, roast for 15 minutes at 220°C/Gas Mark 7 and then turn the temperature right down to 140°C/Gas Mark 1 and leave there for 8 hours or so. When the meat falls apart easily it’s ready to serve. I am entering this slow-roasted lamb with ras-el-hanout into the current Spice Trail challenge, which is celebrating spice mixes from around the world. Disclosure: Spice Kitchen provided me with complimentary spice mixes for review purposes. No money exchanged hands and all opinions are my own. That sounds absolutely delicious, I love lamb with Moroccan spices and I’m jealous of your Aga!